For about as long as I can remember, ballistic types--being amateur or professional--have wanted to understand more about what a payload of shot, single slug, or heavy buck pellets are doing after they leave a shotgun's muzzle. Polywad Inc. in Macon, Georgia was the platform for the bringing together of the most sophisticated measurement equipment in use today, being military, civilian, or science lab, in terms of learning about objects in motion. The Georgia Project was one of the first of its kind and proved to be one of the most effective ways of evaluating shotshell performance. Shipped in from Denmark was a highly sophisticated Doppler radar system built by Weibel Inc. The unit was designed to track military artillery shells, tank rounds, or medium ordnance for miles. Even space satellites were not exempt from radar tracking via the very powerful sky "painting" system. Taking on shot clouds or projectiles that would range to only several hundred yards was small business for this tracking system. But in terms of a ballistics lesson handed to myself and others on the project, the event turned out to be priceless. Headed up by ballistician Alan Corzine, and funded by a new shotshell ammunition company dubbed Pinnacle Ammunition, the project was undertaken at two locations. The first testing was at a lake lodge near Macon, Georgia that housed our staff, computers on a screened back porch, and the radar system itself which overlooked a 200-yard-wide body of water, and ended its tracking search out over a large wooded area that acted as a good backstop for our projectiles as they were tracked across the sky in a long, arching trajectory. Doppler radar won't produce a tracked image like a picture of shot moving through the air, but rather sets a tracking curve that needs to be interpreted by a knowledgeable observer. We had a technician on hand from Weibel that was teaching us what we were observing as rounds went down range and trace radar image appeared on the computer screens. Alan had brought together almost all of the current shotshell ammunition in use today, which ranged from deer loads to duck and turkey fodder. 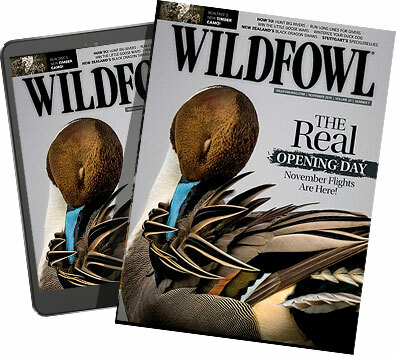 In terms of Wildfowl magazine the interest here is directed to wet bird loads, and as applied to my findings, the events that unfolded did two things. First of all, it confirmed some previous thinking I had regarding shot behavior, and secondly it added more factual information to the equation, and that material will require a good deal of additional study during the months ahead. At about $180,000 per unit, the Doppler radar is state of the art and in effect is an "eye in the sky" that allows the rubber to meet the road, so to speak. When a round goes down range it forms a reverse arching line that starts with the load's actual velocity, drops away sending a line off the screen representing the discarded wad, then lines out each individual pellet in the pattern as velocity falls off and energy drops away. At any point, this payload can be measured for exact velocity and energy generated by the given load type. As to findings early in this program, what I did see was that for the most part all of the high-end loads by Winchester, Federal and Remington are very strong products. Pinnacle Ammunition, being the new kid on the block, was running these tests to see what needed to be done to out-gun the best in the business. If you don't know where to start you are not going to move very far forward, to their way of thinking. Because Pinnacle wants to incorporate both Bismuth shot, being their new pickup product, and a different direction in standard iron pellets as a high performance load (Arrow Steel) this outfit needed to get inside the competition's product to see exactly what was going on as the various payloads head down range. When the radar sends out wide ragged lines on the computer screen the payload is becoming open and rough on the edges. A tight line with few wrinkles indicates energy generation, and tighter pellet mass moving away from the muzzle. Uniform wad release was a key element to the testing, as were uniform and sharp trace lines on the computer screen. What I can say for a solid fact is that those duck hunters that gave up the ship when lead shot went the way of the buffalo were just plain nuts! Even basic steel as in the Winchester Xpert, Kent Fast Steel, and a few others tended to return great looking tracing through the radar down range. Energy held up well to acceptable bird harvesting ranges, and patterns were dense so as to put a workable level of shot on the bird. Yes, there were those loads that tended to get a bit sick at times, but often it was the result of a poorly matched choke that was the culprit. Even gun barrel sizes tended to play a part in performance, and as you will see when I take on 25000 frames per second photo work in a future issue of Wildfowl. Even back bored barrels at times are not the do-it-all system as applied to a waterfowl gun that some folks think they are. Wad Stop chokes, like my personally designed Remington thread based Dead Ringer, or Pattern Master do well with some loads, but stay away from frangible pellets with these systems, and also don't shoot sabot systems like Federal Black Cloud with them, either. I watched fungible shot loads, like sintered pellets in Dead Coyote, turn to powder when going through a wad reduction system. The radar returned a broom bristle effect, or the look of a star burst fireworks round after dark. What you see are individual pellets leaving the core pattern. When sent in mass, it is a sign of a shotshell pattern falling apart. How good is tungsten, and do I need to use this high priced product? As for use, that's an individual choice, but as to answering the question as to how good it works down range, the results speak for themselves. The very shallow and almost flat line generated by this Federal Heavy Weight 3-inch load was enough proof. Hard and heavy tungsten shot just won't leave the sky trail and the degree of drop, or lack of it is clearly evident to any observer. That clean cut pellet race line is evidence that this payload is running very tight to the target and also fighting gravity off quite well. Did we know that all the time? Yes, but it is nice to see it in a clear-cut Doppler image. Can't refute this evidence at all. Old lead shot shooter, pay attention at this point! nd done well when targets are at normal and effective load killing ranges (40 to 45 yards). During testing, we turned to the standard Remington 870 and 11-87 most often with modified tubes (Rem Choke) and a standard .724 bore, as we covered about 350 rounds down range a session each day. Total loads fired were nothing less then massive, to say the last. We had on hand almost very shotshell loaded by the industry today in the test. I had only four days with the team, but these guys had a full second week of hard work still ahead of them at the point I headed back to South Dakota. In terms of future articles this is only the very beginning of data being collected by way of this massive ballistic test program; the tip of the iceberg, you could say. To be sure in time additional reference will be made to "The Georgia Project" as new and previously designed loads are evaluated. Various elements will continue to surface that will require additional study both on paper, and in the real world of in-your-face duck hunting. To my way of thinking, there is no substitute for dead ducks in the bottom of the duck boat. A follow up to this event will be some hard hitting salt water Pacific sea duck hunting so as to take on tough targets under extreme conditions. This fieldwork will be predicated on factors related to the events of the previous ballistic testing. New shot types are up for review, as are extended velocity limits in test loads, and different propellants as applied to various future factory load offerings. New development seems to never go away, but just keeps on coming at us year after year.